In late August, 928 accredited delegates from across the country assembled in Winnipeg for The Royal Canadian Legion’s 47th Dominion Convention, determined to plan a course for the future focused on expanding membership, improving public awareness, fostering a welcoming culture and, of course, working tirelessly to support Canada’s veterans. The city rolled out its best big blue sky for the parade on Sunday, Aug. 26. 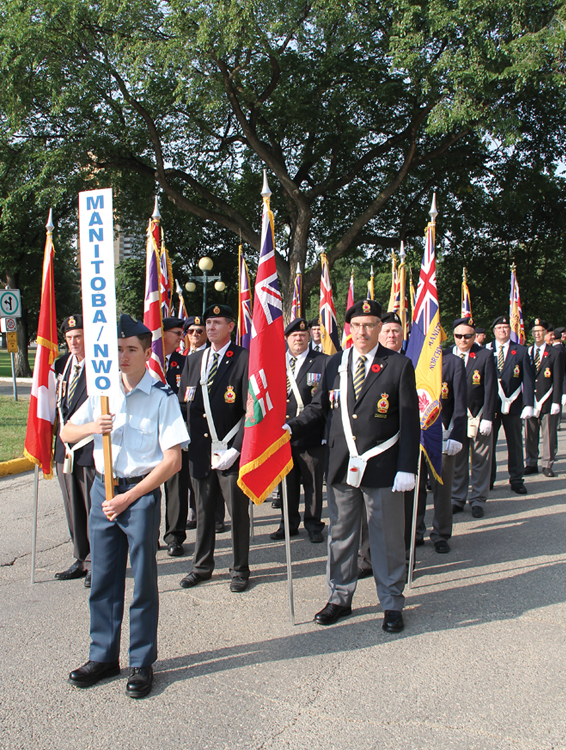 Forming up under the gaze of the Eternal Youth—better known as Golden Boy, a gilded statue atop the Manitoba Legislative Building at the south end of Memorial Boulevard—the parade marched, command by command, to the Winnipeg Cenotaph for a commemoration ceremony. Senior Elected Officers Tom Irvine, Bruce Julian, Bill Chafe, Mark Barham, with Ontario Command Provincial Chairman Ron Goebel, and SEO Angus Stanfield observe two minutes of silence. 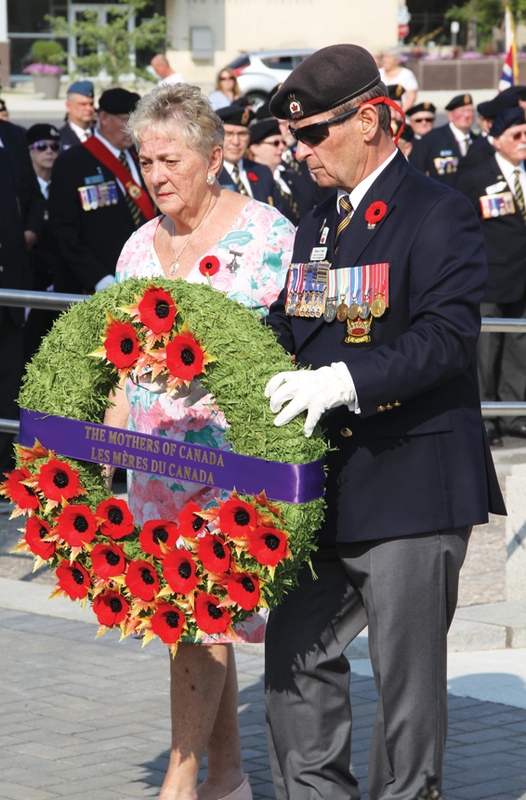 National Silver Cross Mother Diana Abel, accompanied by Irvine places a wreath. 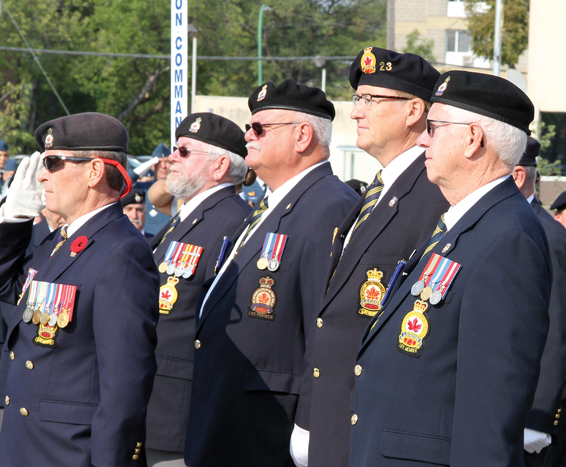 Wreaths were placed by 2017-18 National Silver Cross Mother Diana Abel, Minister of Veterans Affairs Seamus O’Regan, CAF Commodore Mark Watson, RCMP Chief Superintendent Mark Fisher and Sergeant Major Wayne Foster, Government of Manitoba Special Envoy for Military Affairs Jon Reyes, City of Winnipeg Councillor Scott Gillingham, Legion Dominion President Dave Flannigan and Manitoba-Northwestern Ontario Command President Ronn Anderson. Abel, O’Regan and Flannigan then moved to the reviewing stand as the parade marched to the RBC Convention Centre Winnipeg. Delegates gathered there for the opening ceremony. During two minutes of silence, they remembered fallen comrades, including several named who have died since the previous convention in 2016. 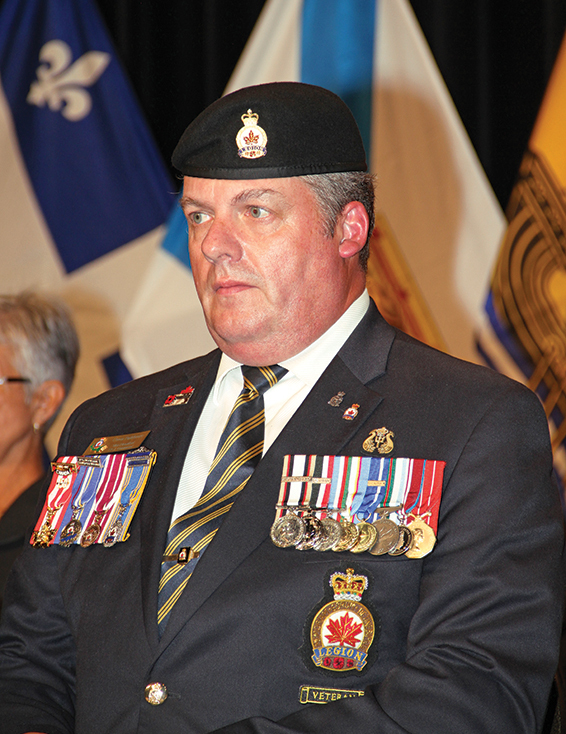 This was followed by the invocation by CAF Chaplain General Major-General Guy Chapdelaine. Reyes, Gillingham and Anderson offered words of welcome before Legion Grand President Larry Murray declared the convention open. 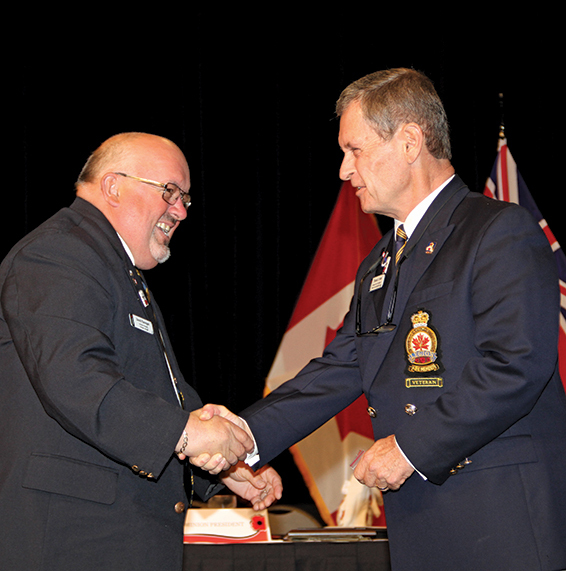 Immediate Past President Dave Flannigan welcomes new Dominion President Tom Irvine at the installation of officers. One of these services, the Career Transition Services Program, already has almost 800 veterans registered, he said. The Education and Training Benefit—which provides up to $40,000 for veterans with six or more years of service and $80,000 for those with more than 12 years of service—has been approved for more than 1,000 veterans over the past five months. Accompanied by VAC Deputy Minister Walt Natynczyk, O’Regan then took questions from delegates in an abbreviated type of town-hall meeting. “Yes, we do,” replied O’Regan. 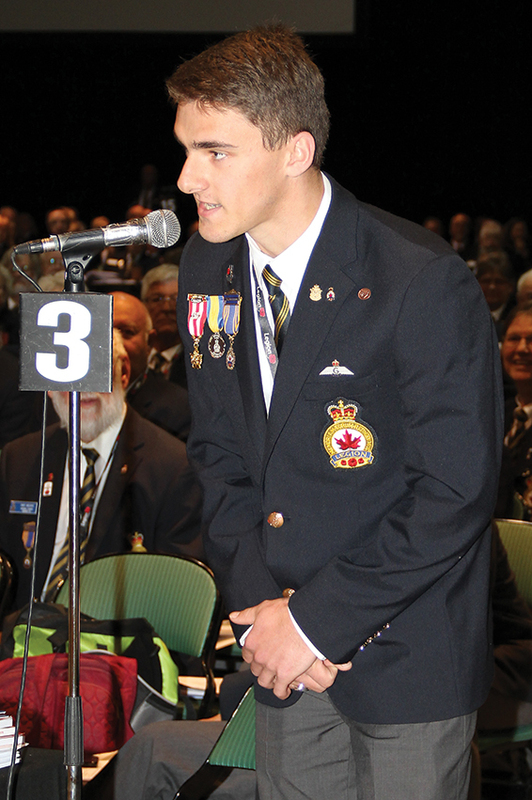 In his end-of-term address, Flannigan recounted highlights of his two years as Dominion President, including representing the Royal Commonwealth Ex-Services League, attending the Invictus Games, visiting Iqaluit, and developing a five-year strategic plan. 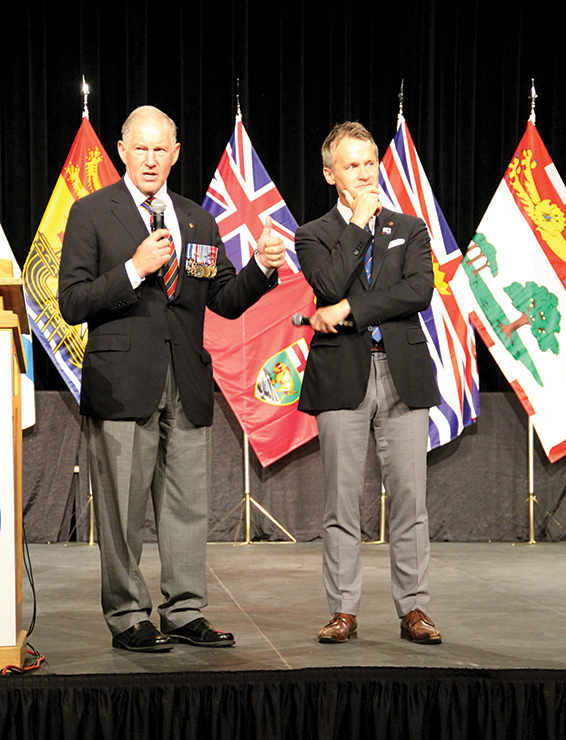 “The Royal Canadian Legion’s participation in the Invictus Games in 2017 was an enormous success,” he said. “To support our ill and injured veterans and get them out of their basements and places they were hiding away and see them back as comrades competing against one another was just phenomenal. In Iqaluit, you see the Legion heart. It’s a totally Legion town. You might think the town has 30 or 40 members. But the branch itself has 42 people on staff! The strategic plan priorities are to expand membership to 300,000, improve communications and public awareness, foster a welcoming culture, increase recognition and value, modernize infrastructure and improve governance effectiveness. Dominion Treasurer Mark Barham then reported that the 2016 and 2017 years ended successfully, with net operating surpluses of $465,869 and $465,978 respectively. The 2018 budget forecasts a modest surplus of $53,259. 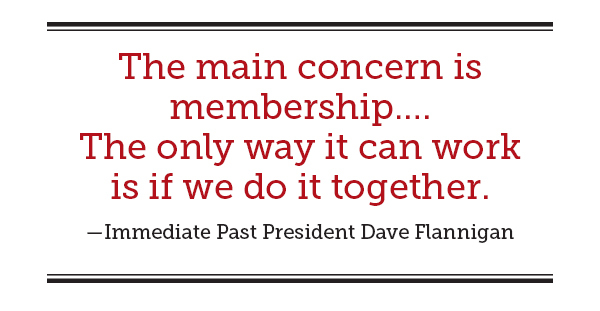 “Declining membership numbers are expected to reduce this amount in 2019 and 2020,” he said, before outlining his “four pillars” of financial priorities: membership, the strategic plan, the Legion National Foundation and new revenue sources. Nominations and the election of officers took place over the two-day course of business. First Vice Thomas Irvine of Hemmingford, Que., Branch was acclaimed as Dominion President. Vice-presidents Bruce Julian of Beachville, Ont., Branch and Angus Stanfield of Sooke, B.C., Branch ran for First Vice, with Julian elected. Stanfield was then included with six other nominees for the three Vice President positions: Owen Parkhouse of Morell, P.E.I., Branch; Ross Petten of Bay Roberts, N.L., Branch; Norman Shelton of Terrebonne Heights Branch in Mascouche Heights, Que. ; Chris Strong of Innisfail, Alta., Branch; Marc Tremblay of Armstrong, B.C., Branch; and Brian Weaver of Capt. Brien Branch in Essex, Ont. Strong withdrew, and Parkhouse, Stanfield and Weaver were elected. Acclaimed for another term was Chairman Bill Chafe of Sarnia, Ont., Branch and Treasurer Barham of North Calgary Branch. Minister of Veterans Affairs Seamus O’Regan and VAC Deputy Minister Walt Natynczyk take questions from delegates. Guest speakers were interspersed throughout the convention, offering delegates a change of pace from their deliberations over reports, budgets and resolutions. “On May 3, 1993, my world came to a crashing halt,” said National Silver Cross Mother Diana Abel, “when a phone call came into our home saying that our son Michael had been killed while serving with Operation Deliverance in Somalia. His job with 3 Commando, Canadian Airborne Regiment, was to support the convoys taking food to the starving and making sure the planes could land to bring this food in from around the world. Veterans Ombudsman Guy Parent offered his perspective on the challenges of serving younger veterans. “Things have shifted in the way we look after veterans and families. Years ago, it was younger veterans looking after older veterans, but now in many instances, it’s older veterans looking after younger ones. And the needs and expectations are quite different. This is why an adjustment is very important. Canadian Armed Forces Commodore Mark Watson described some of the initiatives in Canada’s new defence policy, entitled Strong, Secure, Engaged. Irene Burd, 94, of Centennial Branch in Calgary. In a presentation on outlaw motorcycle groups, RCMP Inspector Kevin Lamontagne and Staff Sergeant Robert Ring of the Criminal Intelligence Service Canada said bike gang members are insinuating themselves into organizations such as the Legion under the guise of supporting community fundraising efforts while trying to gain legitimacy. 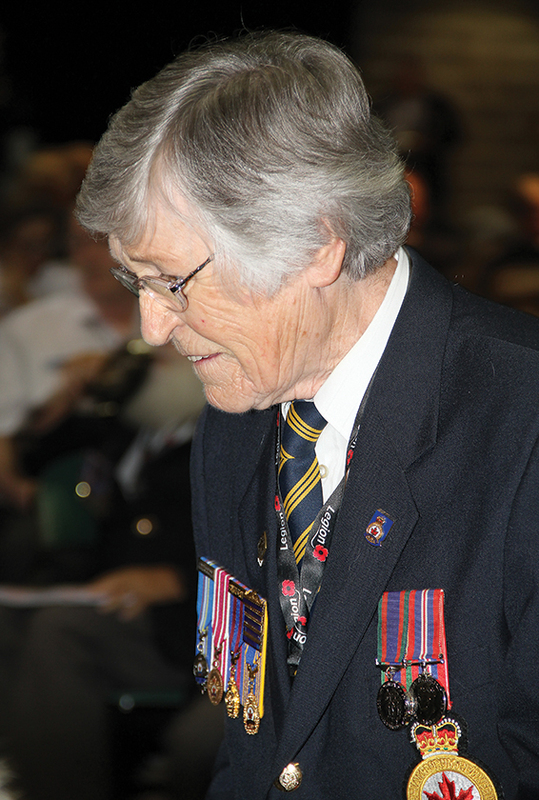 “Last year, I was present at one of the Remembrance Day ceremonies. I observed some members of an outlaw motorcycle gang placing wreaths.… They were retired veterans who were part of this group. I met with the Legion’s executive to pass on this awarenessof who these members were and what this group represents. Our concern was that all these outlaw motorcycle gangs, and the one-percenter groups specifically, use organizations like the Legion, charity foundations and public or private organizations to better their public image. This is their strategy. Newly elected Senior Elected Officer Vice-President Owen Parkhouse. Newly elected Senior Elected Officer Vice-President Brian Weaver. Newly elected Senior Elected Officer First Vice Bruce Julian. Reports and resolutions took up most of the two-day business agenda. Reports and related budgets were presented by chairs of committees, including Dominion Executive Council; Veterans, Service and Seniors; Poppy and Remembrance; Membership; Public Relations; Sports; Defence and Security; Rituals and Awards; Constitution and Laws; and others. The 928 accredited delegates held 2,077 proxies, for a total of 3,005 votes. Each delegate raises one orange card to vote at the convention. Twenty-six resolutions carried. Chairman Chafe allowed ample time for delegates’ questions and debates, on topics including service animals, veterans’ beds in long-term care facilities, homeless veterans, butterfly-clip centres for poppies, the Veterans Independence Program, the poster and literary contests, the foundation, membership types and criteria, the strategic plan, operational stress injury, harassment, headdress, medals, monuments and bylaws. Many of these topics evoked passionate comments from the floor. “The question is: are we going to be allowing everybody to wear their [service] berets, or hats, or whatever?” asked one delegate, commenting on a proposed resolution to allow members of colour parties to wear their military service headdress. “On the colour party, or marching down the street, when you have umpteen other hats, you look very bad. There’s no uniformity. We’re here to promote the Legion.” The resolution was defeated. 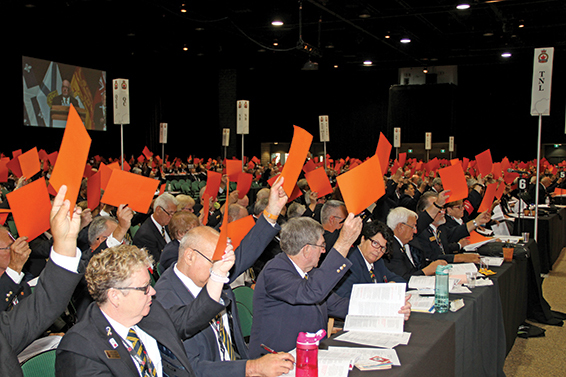 On most of the 55 concurred and non-concurred resolutions (see page 32), the vote was clearly visible from the number of delegates holding their orange cards aloft, but two required a standing count. Resolution #310—to include the Visiting Hospice Program as an authorized special-use expenditure supported by the Poppy Trust Fund—carried with a vote of 363 for and 267 against. Resolution #321—to amend the General By-Laws to include harassment and sexual harassment as a separate complaint subject that would have to be lodged within 90 days from the time of the alleged incident—carried with a vote of 334 for and 216 against. With business completed and after offering thanks to the Local Arrangements Committee, chaired by Rick Bennett, for a well-organized and smoothly run convention, Grand President Murray installed the newly elected officers. “I am looking forward to working with my comrades across the county,” said new Dominion President Irvine. 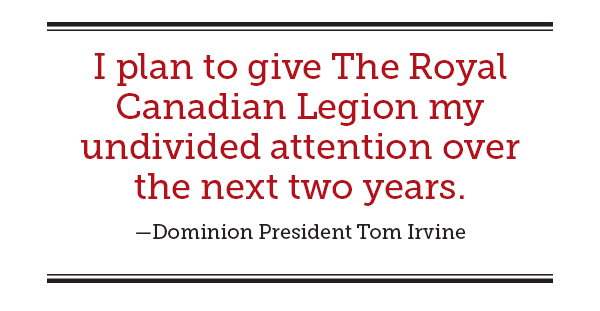 “From advocacy to veterans’ services, to working closely with our partners, I plan to give The Royal Canadian Legion my undivided attention over the next two years. 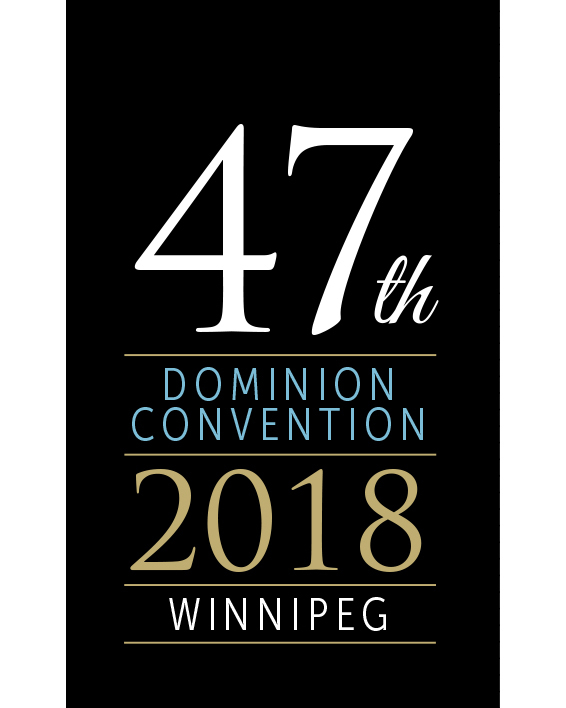 The 48th Dominion Convention will take place in Saskatoon in 2020. The following resolutions were passed by the Dominion Convention in August. Members of The Royal Canadian Legion meeting at the 47th Dominion Convention in Winnipeg send greetings to Her Majesty Queen Elizabeth II, express their loyalty and allegiance and pray that she continues to guide the countries in the Commonwealth. 1. 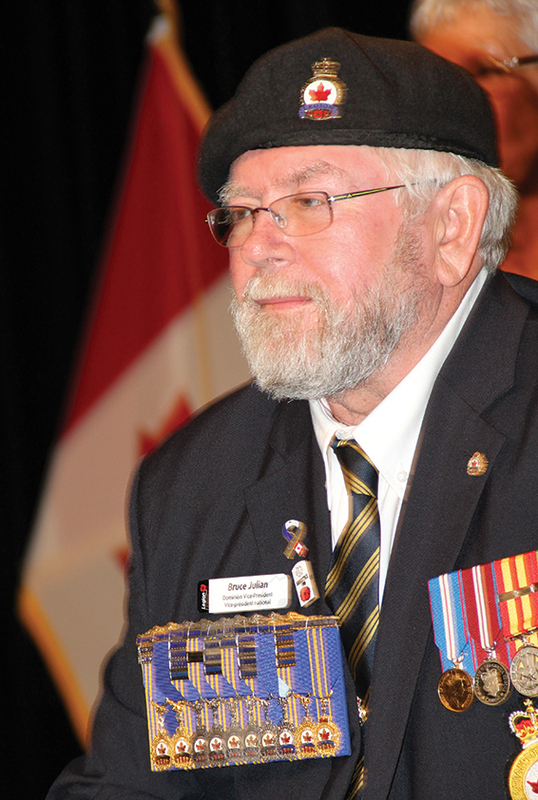 (Veterans, Service and Seniors Committee) Recommends legislation be enacted to open Military Family Resource Centres to all veterans and their families, not just medically released veterans. It further resolves that the centres be renamed Military and Veterans Family Resource Centres. 2. (VSS) Recommends that Veterans Affairs Canada enact legislation to permit Bureau of Pensions Advocates to represent veterans before the Federal Court, free of charge. 3. (ALTA-NWT) Recommends changing the initiation ceremony for branch service officers to include a statement that they will handle all personal information in accordance with all applicable privacy legislation. 4. (ONT) Calls for the position of Veterans Ombudsman to become a permanent and independent position, enshrined in law and reporting directly to Parliament. 5. (VSS) Calls on VAC to enact legislation so that if Veterans Independence Program (VIP) benefits are offered to a survivor at the time of the veteran’s death and he or she declines, that offer be held in suspension until a time that the survivor requires VIP benefits, based on a health-related need. *203. (MAN-NWO) Asks VAC to allow those who have been honourably discharged to receive VIP benefits at age 65, based on need. eligible for financial support from poppy funds. program to help veterans in need of such assistance. or not it has a secondary wall function. 10. (SASK) Expands the Legion poster and literary contests to include a video contest to encourage more student participation. 12. (ONT) Urges the federal government to recognize sunken naval vessels as Ocean War Graves to protect them against pillaging by divers. 13. (ONT) Changes the entry form for the poster and literary contests to include a statement by the student or his or her guardian saying that the student is the sole creator of the entry, beginning with the 2019 contests. 14. (ONT) Adds a statement in the rules for the poster contests to state: “We only accept entries done on paper or Bristol board.” Entries done on materials such as canvas or photographs will not be accepted. *308. (ONT) Changes the Poppy Manual to allow the use of poppy funds to support LAV III monument projects to honour Afghanistan veterans. *310 (ONT) Amends the Poppy Manual to include a visiting hospice program as an authorized Special Use expenditure supported by the poppy fund. *312. 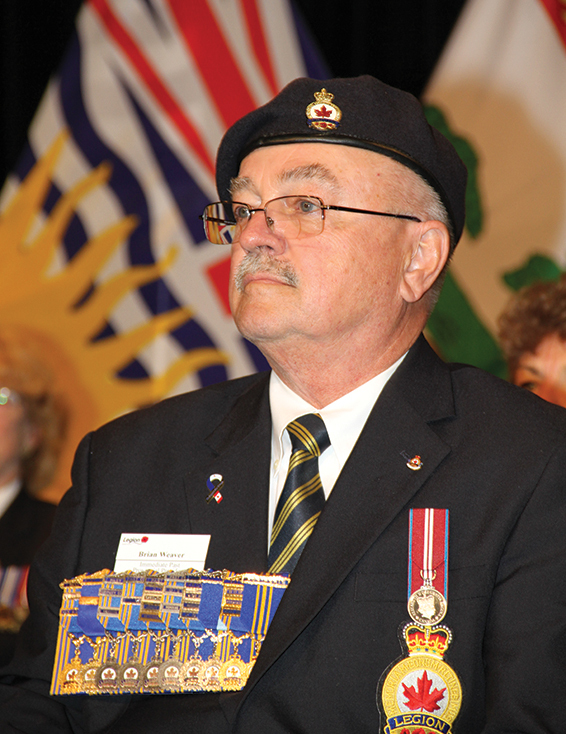 (ONT) Allows any qualified veteran who has never been a member of the Legion to receive a free one-year membership including an electronic edition of Legion Magazine. *314. 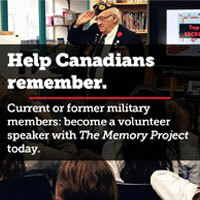 (ONT) Asks the Chancellery of Honours to reinstate and issue the Canadian Volunteer Service Medal. *316. (NS/NU) Urges the federal government to remove restrictions based on date and grant three Memorial Crosses to every family who has lost a loved one while serving Canada. 19. (NS/NU) Adds a reference to the abbreviated initiation/welcoming ceremony approved by Dominion Executive Council stating that the Legion shall stand for loyalty to the reigning sovereign and to Canada. 13/C. (ONT) Allows the Cadet Medal of Excellence to be awarded to Junior Canadian Rangers based on the same criteria as for cadet corps or squadrons. *319. (BC/YUKON) Instructs Dominion Command to strike a Ways and Means bar to be presented to committee chairs. for a building or housing development project whose cost exceeds $500,000. *321. (BC/YUKON) Amends the General By-Laws to establish a separate complaint subject for harassment and sexual harassment, to be lodged within 90 days of the alleged incident. *Denotes non-concurred resolution brought back to the floor by a command and approved by convention.